Check out my other mod monkey birthday posts here and here. As I look through the photos, I realized I failed to take pictures of a lot of different things. 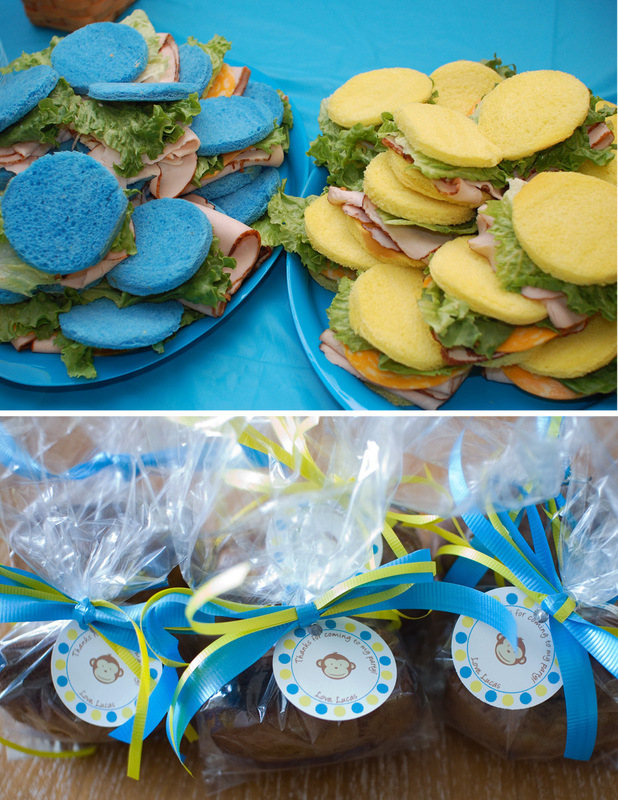 For the food, we had blue and yellow bread made by our local bakery. We used a round cookie cutter to cut the bread into circles. I wasn’t kidding when I said I went with the polka dot theme! All of the food was round. I don’t know if anyone noticed, but it was fun trying to come up with food ideas that fit! The adults were sent home with mini loaves of banana bread. One picture I didn’t take was of the kids goodie bags. I used a white gift bag and glued blue and yellow polka dots along the bottom. Each bag was filled with fun monkey items. 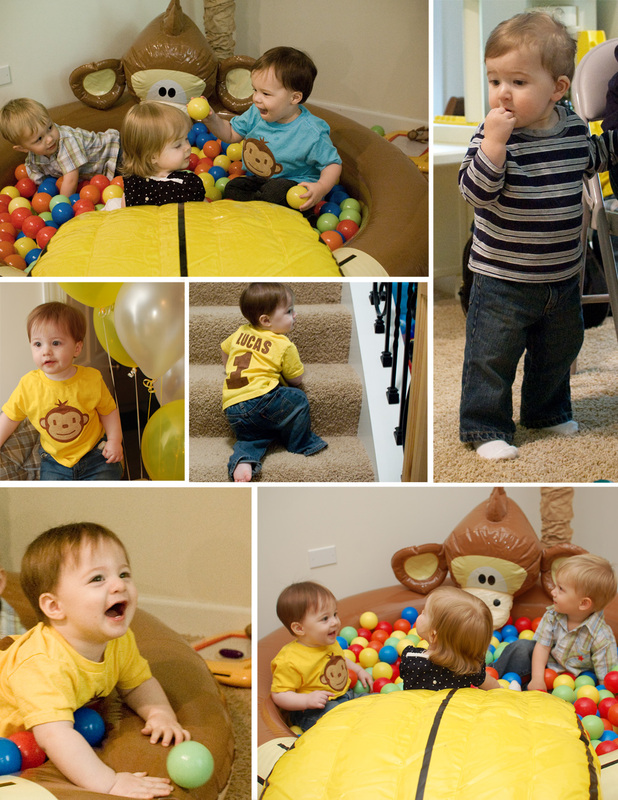 The kids had a blast playing the ball pit we made using a monkey kiddie pool that was complete with a banana slide! It was perfect! You can find the mod monkey shirt here. She does great work and is super fast! Very cute!! Would you mind sharing where you purchased the monkey shirt with your son’s name and age on the back? I’ve had several people ask where the shirt is from so I added a link to the Etsy shop where I purchased them. Hi! I am doing a monkey themed birthday party for my little man and love the monkey pool idea. Would you mind sharing where you purchased that? Love all of your ideas! Thanks for sharing! Hi Jill! Thank you! I found the pool on Ebay. It’s discontinued from Little Tikes. I wanted to know about the bread where can I go to have that done.. and if it expensive to do so… I called several groceries stores and they can’t make yellow, blue bread..
Hi Betsy! The bread was from a small, local bakery. I think it cost about $4-$5 per loaf. Thank you how many sandwiches did you make I called several places and they don’t know what I’m talking about is there a certain way to ask?? I don’t remember exactly how many we made, maybe 50. I believe it’s just a matter of them adding food color to the dough? Sorry I can’t be more help! You wouldn’t happen to want to sell your pool would you? Thanks for all the info! Sorry Jill, I don’t want to sell the pool. The kids love it, not to mention, they have already put a hole in the banana slide. Sorry! what size did you order the shirt do they run small?? I ordered a 2T. They do run a little small. Exactly what I’ve thinking of for my son’s 1st Bday….You sure are creative… CONGRATS and thank you sooooo much for sharing with us. I am also doing a mod monkey themed birthday for my son’s 1st birthday.. Hopefully it works. Hello!! I’m brazilian and i loved your monkey pool. I don’t find it on ebay. Please, give a link on site!